Hair Color Removal Help - What Can I Use To Remove Hair Dye From My Hair? Here's a question I received about hair color removal from a reader. My hair is stained from red hair dye. It was the kind that washes out, but because my hair was a very light platinum blonde colour it happened to stain it and it is now a peachy pink colour. Since Oxyclean is safe enough to eat, and gentle on materials would it be safe to try on my hair? I'm thinking about doing a strand test. Please, oh please, never eat Oxiclean. I know it is safe for most colored fabrics, for washing and stain removal, but that certainly doesn't mean you should ingest it! 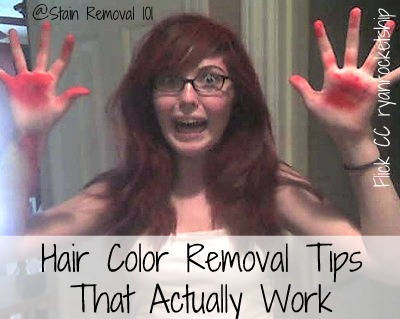 In addition, I would never suggest Oxiclean as a hair color remover. It is designed to be used only on clothing, upholstery, fabric, carpet, hard surfaces and other non-living things. Never on your own living, breathing self. 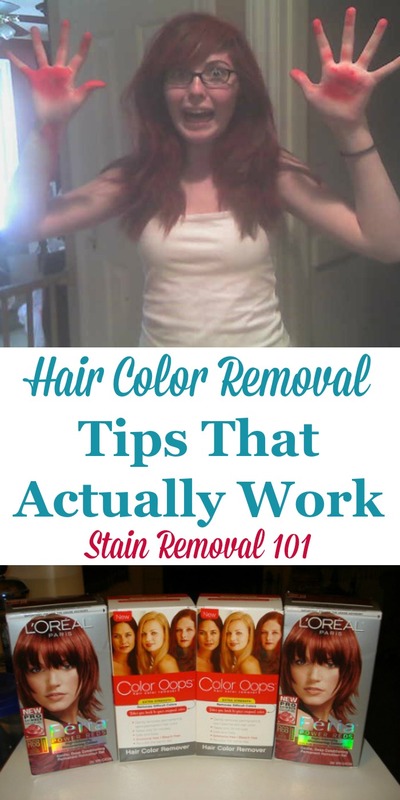 I actually have gotten quite a few questions about hair dye stain removal, but I've mainly focused on how to remove hair color from things that accidentally got dyed, like drips on clothing or the carpet. coloring your hair at home, using products you can find in a drugstore. 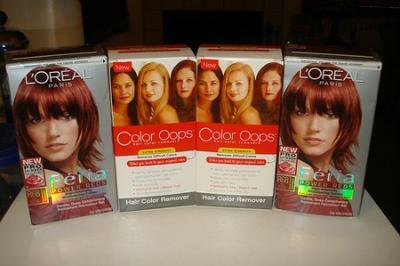 Inevitably, you may try some hair dyes and colors and don't like the end result, just like you did. Lorri suggests that you use a product specifically designed to remove hair color from your hair for the job, instead of household cleaners and stain removers. Specifically, the brand that she recommends by name in this book is Color Oops Hair Color Remover (see links to purchase it below). I've also written a page about hair color remover, for more information and some video demonstrations, if you want more information about this method for hair color removal. (Plus, I've gotten a couple of reviews from readers which I share below). You can purchase this product, in several varieties of strengths, through the links below. I hope this helps! I would definitely use a product designed to be put on human hair to lessen the chance of injury or damage to your hair, instead of Oxiclean! Join in and write your own page! It's easy to do. How? 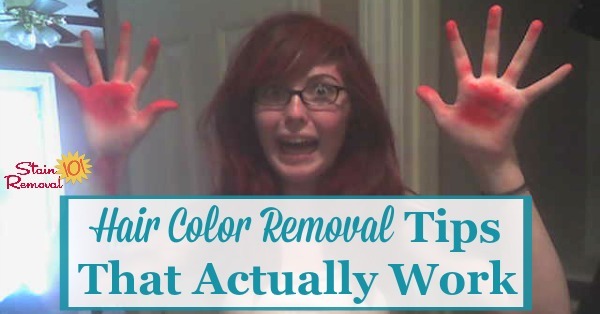 Simply click here to return to hair color remover. Here's a Color Oops review from a reader, who shared how this hair color remover worked for her daughter, after using it for the first time. I used this product on my daughters hair. She had gotten a color that didn't turn out the shade it was on the box, so freaking out she did research as well on the best product to use to strip the color out of your hair without damaging your hair. The worse part about Color Oops is the smell. It is a sulfur based product. It doesn't bleach or damage your hair, but it smells like rotten eggs. I would suggest like we did when we used it on my daughters hair to find a place outside (open porch, screened in room with a lot of ventilation) to apply it on your hair and let it stay on for the recommended time, then go inside to rinse it out. It will still smell up your bathroom just from being in the shower for the short time to rinse it out, but at least it won't linger for a long period of time as it would to be inside with it on your hair for the 20 minutes it says to leave it on. Just a FYI. But I have to say it was easy to apply, and worked very well. Thanks so much for sharing your review of Color Oops. I think this basically confirms my recommendation above to use the product. Unfortunately, there is not going to much that is too perfect since permanent hair dye is meant, you know, to dye your hair permanently! Nice to know there is something you can try though. I'd love to get additional reviews of this product from others, sharing how it worked for them, good or bad. 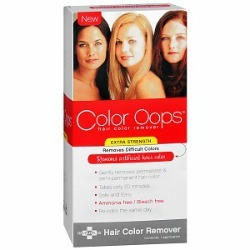 You can share your own hair color remover review here, for this or any other brand, telling me how it worked for you. Lyn also used this product for hair color removal, and shared how it worked for her. I used Color Oops extra strength color remover last night to try to get rid of several years worth of accumulated semi-permanent black hair dye. I followed the directions TO THE LETTER and I have to say that it lifted a lot of the black hair dye from my hair. It doesn't smell as awful as I had read in some reviews, just sort of like sulfur (egg) water. It didn't seem to damage my hair at all and I have very long hair, down to the middle of my back. In some places where the dye had been concentrated on my greying areas it didn't work as well but I feel confident that I can repeat the process and start on these areas first. I think this product would work very well on hair that had not been colored again and again and again like mine has been. I would recommend this product and plan to use it again. You can share your own hair color remover review here, for this or any other brand, telling me how it worked for you.